You are viewing the archive for the ‘Salmon cream cheese’ tag. The word “Lox”, which means cured smoked salmon, conjures up images of bagel, cream cheese, and smoked salmon to most Americans. Salmon cream cheese should be a good idea, right? Smoked salmon cream cheese from a popular brand, named after the city of brotherly love, was disappointing. It just didn’t seemed like enough smoked salmon and looked off. I found these differences after scanning through the ingredient list between their smoked salmon cream cheese and regular cream cheese. Although smoked salmon was the third most abundant ingredient, fourth and fifth, were milk products. Regular cream cheese has only whey as extra milk ingredient, albeit we don’t know exact percentages. Salmon flavor is enhanced by monosodium glutamate, sugar, natural smoke flavor and preserved by sodium nitrite. 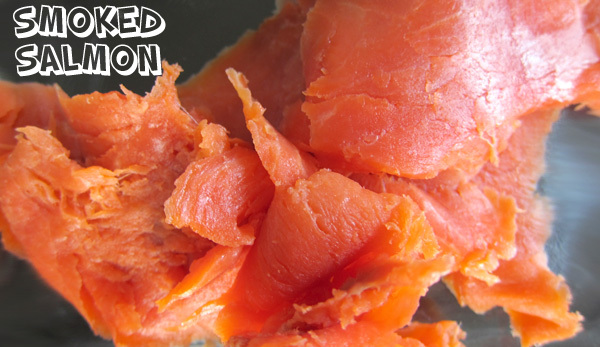 The reddish salmon color is given by oleoresin paprika (Color) and Rd 40. These are differences are even sharply differentiated in table below, where items found in salmon are in red. The salmon cream cheese had twice as much ingredient as regular cream cheese from same manufacturer. others stabilizers (xanthan and/or carob bean and/or guar gums) (9), sorbic acid as a preservative (11), vitamin A palmitate (15) stabilizers (xanthan and/or carob bean and/or guar gums) (6), sorbic acid as a preservative (7), vitamin A palmitate (8). * the number inside parenthesis are the order on the list of ingredients. 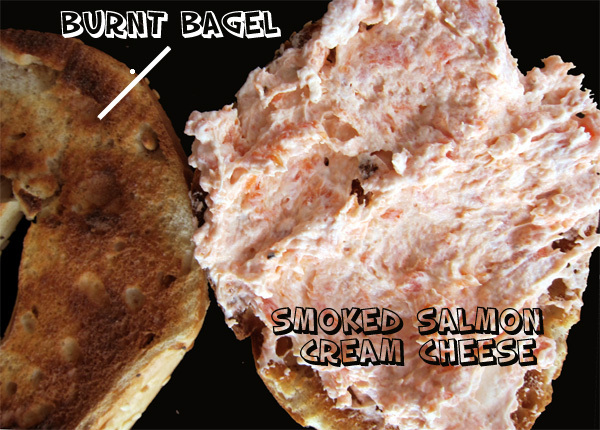 It doesn’t mean that I give up my lox cream cheese dream if they don’t make a decent smoked salmon cream cheese. It’s really simple to make, skip extra ingredients and just add smoked salmon to cream cheese. It’s extra salmon, but I assume if you are making it, you must like smoked salmon . Use a fork to flake smoked salmon. Gently fold cream cheese to salmon. To soften cream cheese, make sure to keep it at the room temperature for at least ½ hour. Eat lox cream cheese with furikake bagels. It’s good even with burnt ones.